A Billy Packer personal appearance, Billy Packer speaking engagement, or Billy Packer endorsement will reflect well on your company. To hire Billy Packer now for any corporate appearance, fundraiser, motivational speaker event, personal appearance, autograph signing, or website endorsement please contact our celebrity agents at 1-877-6-SPORTS. We will contact Billy Packer or contact Billy Packer's agent and provide you with the booking fees and availability immediately upon your request. Direct Sportslink is the only sports speakers bureau and talent booking agency based in the United States securing only sports talent for corporations, associations, and organizations for motivational speaking engagements, personal appearances, and endorsements. We are the premier sports celebrity booking agency and a sports celebrity procurement expert. Accordingly, we will provide you with any relevant Billy Packer website information and booking agent details so that you can hire Billy Packer for your next event. 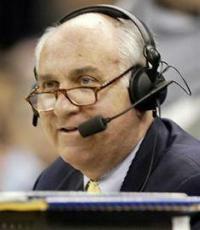 For more than three decades, Packer served as a color commentator on network television broadcasts of college basketball. Packer attended Wake Forest University from 1958 to 1962 and played guard on the school's basketball team for his last three years (in his day, freshmen were not eligible for varsity sports), leading Wake to three ACC titles and the 1962 Final Four. After graduation he had a brief stint as an assistant coach for his alma mater, then began his broadcasting career on regional ACC telecasts in 1972. Since the mid-1970s Packer has been a fixture on national telecasts, first with NBC and then CBS. He won a Sports Emmy Award in 1993. Based on your interest in Billy Packer as a speaker or for a personal appearance, Direct Sportslink has provided you additional links below for other sports talent with similar appearance fees, speaker topics, and categories that match Billy Packer.